Costa del Sol El Salvador. Costa del sol is a very famous beach located in the department of La Paz, is well known as one of the most exclusive beaches in the country, Costa del Sol is divided in two areas, one is the beautifull sandy beach right at the shore of the ocean and the other side is the mangroove where most of the different land lords of the exclusive beach houses residential have boats and yats. Costa del Sol is also known because it has the best hotels with higher standard and quality like Confort inn, Bahia del Sol, Tesoro Beach, and several mores. At Costa del Sol the different activities are hourse riding, boat trips at the mangrooves and in the ocean, fishing expeditions, renting jet sky and stand up paddle. To make the different activities is always better to contact a tour operator company. 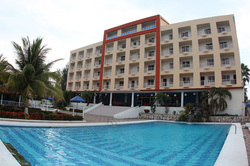 Great hotel with the best rates in the area, confortable rooms with balcony o terrace infront of the ocean, air conditioner, cable tv, hot water, room service, restaunt, swimmingpool. 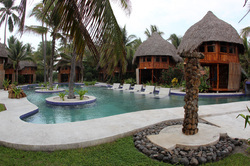 Mizata is located a few kilometers west from La Libertad, is known as the last surf area in La Libertad, uncrowd surf for quiet travelers looking for privacy, visit our Mizata El Salvador Hotel.